Congress Party on Tuesday said its popular jobs scheme Nyaya will go through a testing phase of 6-9 months before rollout. Announcing its manifesto ahead of the Lok Sabha elections, the party said , "There will a be Design phase (3 months) followed by a Pilot and Testing phase (6-9 months) before roll-out of the scheme." Congress President Rahul Gandhi announced the ambitious NYAY scheme on March 25 this year. The minimum income support scheme (MISP) promises to provide Rs 72,000 annually to 20% families in poorest of the poor category, benefiting around 25 crore people. The target population will be 5 crore families who constitute the poorest 20 per cent of all families. Unveiling the details of the rollout, the party in its manifesto said, "The estimated cost will be <1 per cent of GDP in Year 1 and <2 per cent of GDP in Year 2 and thereafter. As the nominal GDP grows and families move out of poverty, the cost will decline as a proportion of GDP." The party led by Rahul Gandhi will appoint an independent panel of eminent economists, social scientists and statisticians to oversee the design, testing, rollout and implementation of the programme. The programme will move from one stage to the other only after a 'go ahead' from the panel. "Congress intends to implement NYAY as a joint scheme of the central and state governments. The scheme will be funded through new revenues and rationalisation of expenditure. Current merit subsidy schemes that are intended to achieve specific objectives will be continued," the manifesto declared. 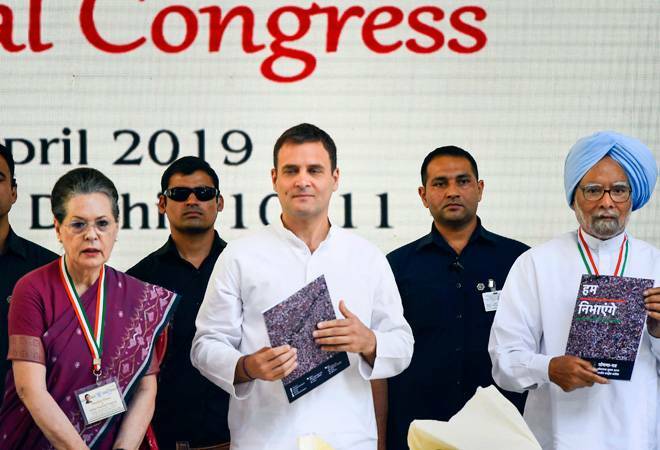 Congress president Rahul Gandhi on Monday said the money proposed to be given to the poor under 'NYAY' scheme would be deposited in the accounts of women. "This money would go to the bank account of the woman in the family. Every month, this money will directly go to the bank accounts of women. Crores of women will get power and India would stand on its own," he said in an election rally recently. Senior Congress leader Chidambaram last month said the NYAY scheme would cost 1.8% of the GDP at any given time, and as per the party's calculations, it "will not cross 2% of the GDP". Congress general secretary Priyanka Gandhi Vadra hailed the Nyay scheme on March 26 and said, "She's happy that women will receive Rs 72,000 per year directly into their bank accounts under the minimum income guarantee scheme announced by party chief Rahul Gandhi."